Air monitoring in nail salons has detected formaldehyde, acrylic dusts and vapours, dibutyl phthalate, ethanol, acetone and toluene. Liquids and chemicals, such as ethyl methacrylate monomer solutions, cleaning solvents, and primers, will evaporate and give off vapours - harmful fumes if inhaled in sufficient quantities. Likewise, protection is needed against inhaling dust that is created when filing acrylic nails. Nail Salons have a real need to implement air cleaning solution for customers, staff and often building/centre managements. We help devise and implement air purifying solutions for Nail Salons that are appropriate to their size (sqm) and amount of activity. The IQAir GC Multigas model is a world favorite for the removal of odours, chemicals, gases, VOCs, fumes and smoke. Its Multigas (MG) media will remove deadly nitrogen oxides (NoX) and is particularly effective in the removal of salon chemical fumes.This uses not only activated carbon like other air cleaners, but four cartridges (5.5kg) of carbon/Chemisorber - a blend of activated carbon and ChemiSorber and a unique scientific formulated media designed to adsorb the widest possible chemical spectrum, including all the chemicals mentioned above. No other air cleaner offers this filtration capacity. The Multigas will also remove the fine dust particles via its pre-filter and particle capture sleeves. Coverage area +100 sq mts. The IQAir Gc Multigas features 4 stages of filtration, all sealed within an air tight construction to ensure that every litre of indrawn air is purified - no leakages. Stage 1 Hyperhepa Pre-filter: Air is drawn into the GC Multigas through the bottom of the unit by the powerful fan and passes through the H11 Grade prefilter. This process removes all sizes of particles from the air, including ultra fine particulate. Stage 2 Four Cartridges of gas filtration media: These contain media which will adsorb chemicals, fumes, VOCs, gases, odours and smoke. There are several types of media, depending on the particular contaminants present. The Blueair 680i is suited to large salon areas with one of the largest clean air delivery rates of 830m3/h. It is also a very attractive unit for its size that fits well into stylish, well designed salon environments. Its electronic particle and gas sensors automatically detect dust or chemicals and immediately increases fan speed to clean the air. This model also feaqtures wi-fi connectivity - control via your phone. 1. 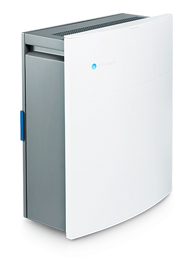 Blueair's laboratory tested HEPASilent™ technology captures 99.97% of the tiniest 0.1 micron particles, including allergy-provoking pollen grains, dust mites, mold spores and pet dander particles. 2. Highest quality adsorbent carbon granules for removal of gaseous pollutants such as odours, wood/tobacco smoke, traffic fumes or VOCs (Volatile Organic Compounds from household paints, other chemicals). Also mycotoxins from mould growths. The Blueair 480i offers a coverage area of 40m2 and might also be appropriate in smaller areas. Ideal for smaller or more localised sections within the salon such as nails treatments. Its combination particle/carbon filter removes nails dust as well as offending chemical odours and fumes. 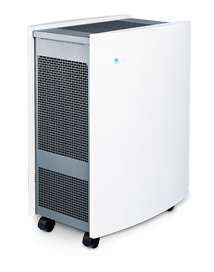 Removing dust particles 0.1 micron in size and larger, the Blueair 205 is whisper quieter even while turning over high air volumes. The 205 model also feaqtures wi-fi connectivity - control via your phone. We can guarantee that our air purifiers provide the highest levels of particle, gas and odour filtration.